Throughout her life, Mary Service (Mrs Saunders) helped the Smith, and it is fitting that her portrait is now part of the Smith’s collections. 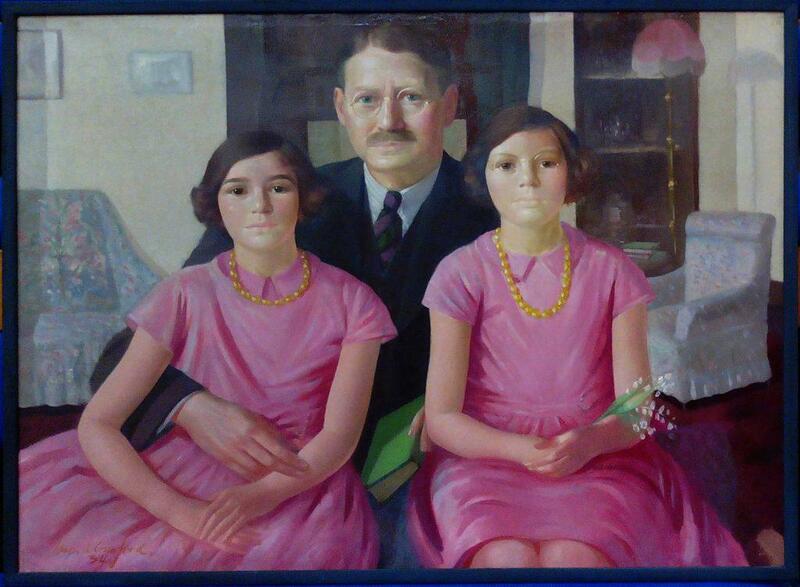 This charming family portrait is one of seven works bequeathed to the Stirling Smith by Mrs Mary Saunders (1924-2012). It is by the eminent Glasgow artist, Hugh Adam Crawford (1892-1982) and was painted in 1934 in the family house in Kingsborough Gardens, in Glasgow’s west end. The family is that of William and Winifred Service. William Service was an engineer, and a director of the Parozone Company (now Jeyes). He is painted in the drawing room with his daughters Mary (aged 10, later Mrs Saunders) and Joan (aged 8). When in adult life, marriage brought Jean to Stirlingshire, her sister Mary followed, taking a house in King’s Park, next door to the Smith. When the Smith reached its centenary in 1974, it was in such poor physical condition that demolition seemed the best option. There was an additional proposal to make the area a car park for a funicular railway serving Stirling Castle. At a crucial point, Mary Service came forward with a significant capital sum, which restored the Ballengeich Room, showing how good a fully – restored Smith building could be. This was opened in 1977, and the Smith has never looked back.